Polyethylene (PE) Super Traffic Cones are placed on roads or footpaths temporarily as a mean to redirect traffic safely. They are often used to create separation or merge lanes. 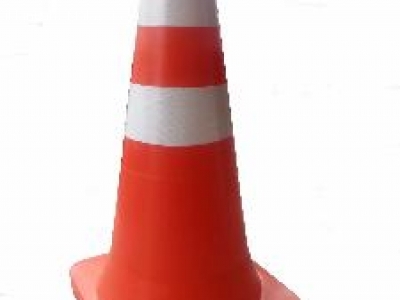 PE Super Traffic Cone is popular as it is effective in traffic control management because of its oversize height offer better visibility and most often this traffic cone is also used where there presence of high human traffic and the ready hole with plastic chain serves a barrier to prevent human bypass the cone into the restricted area. Polyethylene (PE) Super Traffic Cone 1,067mm (H) with square base 510mm market and sale by Flexijoint Industrial Marketing & Services, Kuala Lumpur, Malaysia. For further enquiry, please contact us at T: +6 03 79541136 M: +6 016 3111313 F: +6 03 79808259 E: flexijoint.ims@gmail.com.